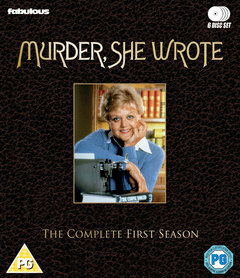 A new chapter begins as Season One of TV’s most popular and widely acclaimed detective series, Murder, She Wrote, comes home to Blu-ray for the first time ever, now fully restored and in high definition! Angela Lansbury stars in the role that earned her 12 consecutive Emmy® nominations as everyone’s favourite super-sleuth, Jessica Fletcher, a famous mystery writer who has a knack for solving murders on and off the page. Along with the quirky residents of Cabot Cove, Maine, Jessica is joined in her deliciously suspicious tales of mystery and mayhem by some of the most celebrated guest stars of screen and stage, including Jerry Orbach, Leslie Nielsen, Joaquin Phoenix, Andy Garcia, Martin Landau, Milton Berle, Peter Graves, Vicki Lawrence and many more. Investigate all 22 Season One episodes including the suspenseful original pilot movie, The Murder of Sherlock Holmes, of the illustrious and thrilling series that will have you guessing “whodunit” until the very end. Corey Allen, John Llewellyn Moxey, Richard A. Colla, Seymour Robbie, Allen Reisner, Alan Cooke, Walter Grauman, Edward M. Abroms, Peter Crane, Charles S. Dubin, Arthur Allan Seidelman. Angela Lansbury, Claude Akins, Tom Bosley, Milton Berle, Linda Blair.